Taken captive by Gunnar Rutledge, a dark knight sworn to destroy her father, Raina d'Bussy must teach forgiveness to a man who knows no mercy and lives only to exact revenge on his enemy. But time in Gunnar's keep stirs an unwanted passion in Raina, and something far more perilous, when she finds herself falling in love with the one man she should never desire. For Gunnar, vengeance is all that matters. He seeks the ultimate price from his enemy's beautiful young daughter, claiming Raina as his hostage. But the proud beauty defies him at every turn, tempting him like no other. Setting out to break Raina's glorious spirit, Gunnar instead finds himself bewitched by her goodness, her strength. Can he seize the justice he is due without losing Raina forever? 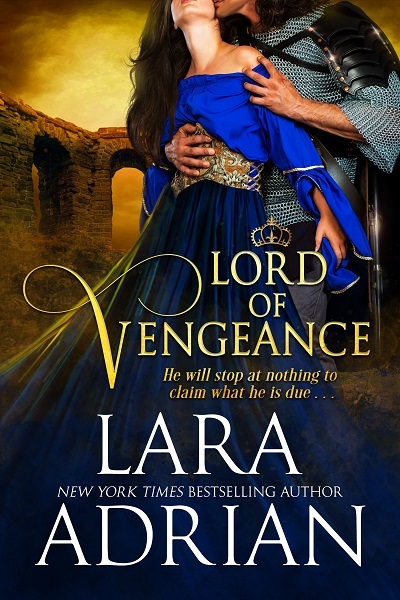 "Between the hero and heroine, a secret that I was not prepared for (which is a definite plus) and the action building to a fevered pitch toward the end, there was little or nothing not to love in Lord of Vengeance. All in all, it is a truly wonderful read."